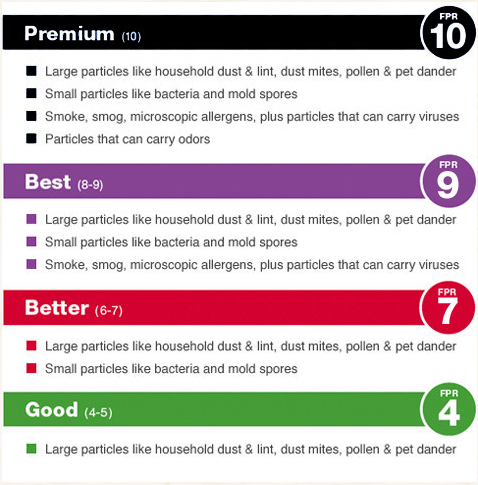 Air filter ratings: an explanation for the domestic user • The Air Geeks, reviews of air conditioners, dehumidifiers and air purifiers. Most of today’s air purifiers use filtration mechanism to remove airborne pollutants from the air. A combination of filters is usually used to ensure that the filtered air is free from different contaminants. 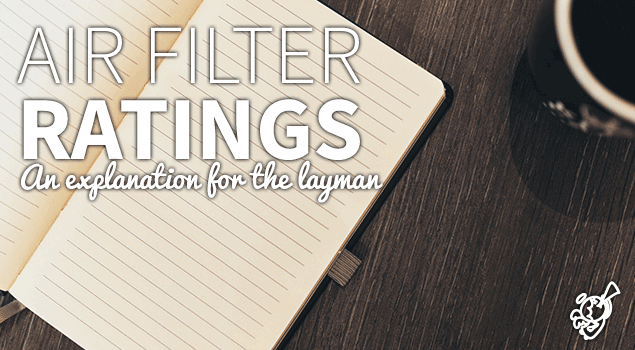 A pre-filter captures large airborne particles while a HEPA filter traps the small ones. Most filtration-type air purifiers that use HEPA technology are capable of capturing up to 99.97% of airborne contaminants. Furthermore, HEPA filters trap minute particles that are as small as 0.3 micron in diameter. Before you select a particular air filter for your air purifier, it is important that you understand what it is capable of trapping. The capability of an air filter is determined by its air filter rating. Whereas some filters are capable of capturing only two or three types of airborne contaminants, others can remove a wide variety of airborne particles. The Minimum Efficiency Reporting Value, the Microparticle Performance Rating and the Filter Performance Rating are the most commonly used air filter rating systems. The Minimum Efficiency Reporting Value (abbreviated MERV) rating system was created by the American Society of Heating, Refrigerating, and Air Conditioning Engineers (ASHRAE). The MERV rating system is used by industries internationally and it rates a filter’s capability to trap and hold airborne particles and pollutants. To start with, an air filter that is rated MERV 6 is capable of capturing household dust, lint, and pollen. A MERV 8 air filter is capable of capturing household dust, lint, pollen, mold spores, and dust mites. A MERV 11 air filter is capable of trapping household dust, lint, pollen, mold spores, dust mites, smoke, smog, pet dander, and cough. Lastly, a MERV 11 air filter is capable of trapping a wide variety of airborne contaminants including household dust, lint, pollen, mold spores, dust mites, smoke, smog, pet dander, cough, viruses, and bacteria. The Microparticle Performance Rating (abbreviated MPR) system was created by 3M. This system rates a filter’s capability to trap airborne particles that are smaller than one micron. An MPR 300 filter is capable of capturing household dust, lint, and pollen. An MPR 600 air filter is capable of capturing household dust, lint, pollen, mold spores, and dust mites. An MPR 1000 air filter is capable of trapping household dust, lint, pollen, mold spores, dust mites, smoke, smog, pet dander, and cough. Lastly, an MPR 1900 air filter is capable of trapping a wide variety of airborne contaminants including household dust, lint, pollen, mold spores, dust mites, smoke, smog, pet dander, cough, viruses, and bacteria. The Filter Performance Rating (abbreviated FPR), was developed by the Home Depot. This rating system is used by Home Depot to rate brands that they sell. This rating system uses a number scale and a color code. This system is similar in many ways to the MERV system. An FPR5 air filter is capable of capturing household dust, lint, pollen, mold spores, and dust mites. An FPR7 1000 air filter is capable of trapping household dust, lint, pollen, mold spores, dust mites, smoke, smog, pet dander, and cough. Lastly, an FPR10 air filter is capable of trapping a wide variety of airborne contaminants including household dust, lint, pollen, mold spores, dust mites, smoke, smog, pet dander, cough, viruses, and bacteria.